After you have setup your show, you will want to schedule it to run. 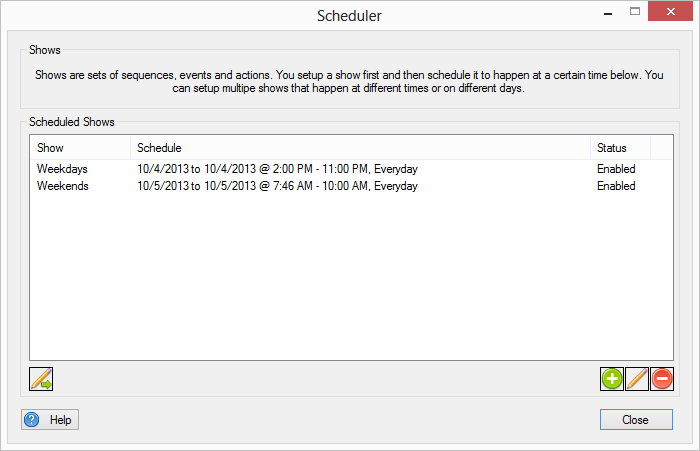 To get to the scheduling in Vixen, Select “Create Schedule…” from the main menu. 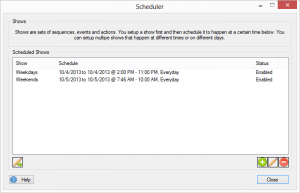 Once you have selected “Create a Schedule…” from the Vixen main menu, you will be presented with the Scheduler screen. From this you can view your currently scheduled items, and add, edit and delete scheduled items. To access the available options, you can either right-click in the list or press one of the buttons below the list. Select this button to add a new scheduled item. Select this button to edit the selected schedule item. Select this button to delete the selected schedule item. Pressing this button will edit the show associated with the selected scheduled item. By selecting either or above, you will be presented with the following Schedule a Show screen. 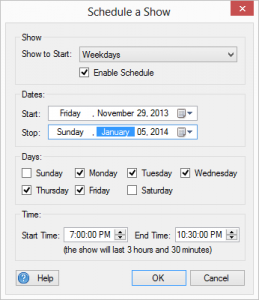 The Schedule a Show dialog will allow you to setup your show to run on certain days at certain times between the dates you set. For a show to successfully run, ALL of the following options must be true. For example, it must fall on or between the dates selected, the day of the week must be selected and the time must fall on or between the times selected. First, you want to selected the show you would like to run when this schedule is executing. The show is setup in the Show Editor before setting up the schedule. Shows can be either enabled or disabled. This allows you to setup a bunch of different schedules as tests or whatever you want and set them to disabled if you don’t want them to execute. Select the date you want your show to start and the date you want your last show to run. Check the days you want your show to run. Enter the start time and end time of your show.